Who Is the Administrator of my Home Network? - Ask Leo! Some Windows messages indicate something was set by your network administrator. That's probably you, even if you didn't do it. Windows often advises that you “contact your network administrator” or it has a feature that has been disabled by the network administrator. But on a home network, one is the network administrator! How does one log in as the “network administrator” (as opposed to a normal administrator account) or override these settings? 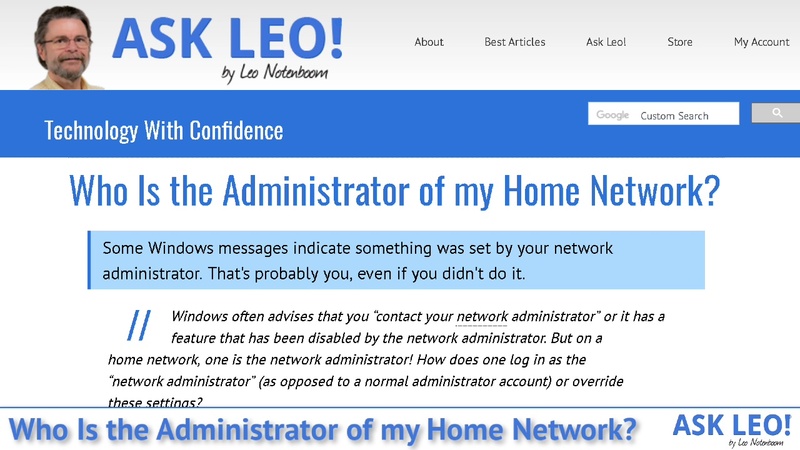 You’re quite right: you are the network administrator of your own home network. In many ways, this terminology is a manifestation of the fact that in many ways, Windows is designed for large businesses, which feature larger and more complex networks managed by real, honest-to-goodness network administrators. There is no separate network administrator on your machine. Exactly what steps you need to take depend on the specific situation you facing. Network administrators are used in larger installations to protect the network and keep it running smoothly. Disabled by the network administrator? I laugh a little every time I see that message, because it’s so silly at home. No network administrator walked in while I wasn’t looking to change my network configuration. I’m the network administrator, and I didn’t set, change, or disable whatever it’s telling me I did. Most of the time, these are simply the default settings in Windows. … but certainly not by some network administrator who doesn’t really exist. There is no separate network administrator, and there is no separate login for a network administrator. There is an “administrator” account, but it’s the administrator account for your entire machine. It’s normally hidden, because on most current machines, your normal log-in account already has administrative privileges. As a result, you already have access to everything that might be used to administer your network (as well as your entire machine). Yes, you probably are the administrator already. You just may have to take extra steps to do things “as” the administrator: Why Does My Computer Say I Need to Be Administrator, When I Am? The best tool — next to having a friend who’s well-versed in administering Windows networks — is a search engine, like Google. There is no one place, no one setting, and no one tool to control everything that falls under the purview of this mythical network administrator. You might need to make changes in the network section of the Control Panel or the Settings app. You might need to run the Group Policy Editor, if your version of Windows has it, to change settings therein. You might need to make changes directly in the registry for settings that aren’t exposed in any other way. You might need to use a third-party tool. As you can see, there’s no simple answer. It all depends on the specific situation that’s causing Windows to blame the “network administrator”. That’s why I strongly recommend you use a search engine. Search for the exact text of the error message you’re seeing, or a concise description of what you were attempting to do. Chances are you’re not the first person to encounter whatever you’re seeing. Why even have a “network administrator” at home? Here’s what I think is going on: in larger corporations, network administrators need to exert control over the network in the form of assorted configuration settings, policies, and more. It’s an important part of controlling the security, functionality, and acceptable use of their networks. They don’t want individual users on their networks making changes to the configuration, or accessing certain functions at all. Rather than pointing at the specific configuration setting preventing you from doing something, Windows simply reports that your “network administrator” has disabled — or whatever — that particular item. If you’re working in a larger institution that actually has one, you then contact the network administrator or IT person. If you’re at home and somewhat network-savvy, you’ll know what to fix or how to research a solution on your own. And if you aren’t … you won’t. Misleading wording aside, that’s kind of a good thing. Networking is frustratingly difficult and complex. It’s hard to get it working and easy to break. If you’re not network savvy, it’s good to have that extra barrier in place to prevent you from making changes that could make the situation worse. At the very least, I hope it’ll cause you to pause and carefully research the solution for your particular situation, or find someone knowledgeable who’s willing to help out and become — for a moment at least — your network administrator. How Should I Set Up My Home Network? 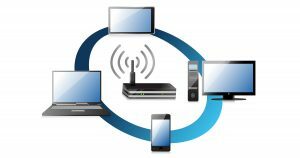 - A home network allows you to share a single internet connection, as well as data and devices, between multiple devices. I'll review the basics components of a home network and some steps to take as your network grows. How Do I Get My Windows Machines to Network with each Other? - Home networking can be very difficult. But I have a little trick that works easily for me. « Previous post: What Is Pagefile.sys? Can I Delete It? I run my machine as Administrator so I have control, so to speak, over most of what happens. Anybody else runs in Guest Account so they can’t screw stuff up, on purpose or by accident. Who do you trust? In my case, me, myself. It’s MY computer and if I screw up who can I blame. “Contact the the network administrator.”? Ok, I can do that; I’m not running a network and I be the Administrator. This might not help, but it’s the way I do it. I mainly use XP Pro (though I have other Windows versions on other machines). This situation came up on my XP machine, so I decided to include a logon password at boot prompt a half year ago and have never received the error since it was done. I had Microsoft 2010. Until my computer was sent away to get washed and it got deleted and i was only left with the standard Microsoft 2000 any way i could get the product key back and get it working again? I assume you mean MS Office 2010. The product key would either be on a card or sticker which came with the installation media, or if you bought the program on-line, it would be in the confirmation email you received when you bought it. Otherwise, you’d have to buy it again to get it. if you have a home network AND you work for an employer with a large network, you employer’s network administrator can be a great resource. I’m somewhat surprised you did not mention that person as a resource. Actually it’s great if you can find a helpful resource like that, but honestly … I’ve never experienced it (they’re overworked at work with little time to help non-work related issues), and yours is the first time I’ve heard anyone mention it. Consider yourself lucky if you’re in that position. I was in that position when working but am now retired. I was in Engineering right next to the IT group and had several friends there. Most of them had home networks too and with their help I could stay on top of things. That’s the biggest thing I miss about going to work, now all I have for problem solving is Google. I laugh a little every time I see that message, because it’s so silly at home. No network administrator walked in while I wasn’t looking to change my network configuration. Not good to be so cocky. Many things can go on at night when you are asleep or otherwise out of the way. If Microsoft wanted then they could promote themselves to your network administrator and they would not even have to walk in to do that job. Of course, they can and in a way they are. They are the ultimate administrator of Windows. Is it “cocky” to think that I want Microsoft, and their “Spy vs Spy” attitude to be GONE from MY self-built computer? Do “things” really go on at night when MY high-performance computer is powered “OFF”? Should “I” be limited by somebody’s software that does NOT know me, or what “I” am desiring to do with MY machine? Regardless of OTHER people’s limitations, or their need to be protected from themselves doing damage to their system, “I” do NOT wish to be bothered at any inopportune time, to jump through hoops, be dominated, be denied–when “I” am the “BOSS” of all I purchased. I know the limits of what software is never mine to do with as “I” want, even after I have paid full retail money for it. They need to have an easy way–or someone to reveal the secrets to taking ALL that limitation off. Including the silly: “Do you really want to do that”–after I explicitly really wanted to do that–don’t ask me if I want to do what I want to do, fool! I only illustrate the most basic of Windows’ lameness–the embedded nuisance is far-reaching, as everyone knows. At least this one is simple to overcome in Control Panel, though (I use Win7x64 Ultimate) later versions, like 10 are even more complex and not owner friendly. Yes, I know you never “OWN” Windows, since they believe themselves to be ‘gods’ or something similar. “I” want a truly ‘mine’ experience, without training wheels on the OS! Nor do “I” want to create my own OS, make my own shoes, or grow my own food, or live under communism. Though this may seem kind of pissy, I am really a nice guy, tired of being told that I can’t do something I WANT on what I feel is MY RIGHT to want. At the Nature Center where I volunteer my retired time in a mechanical/electrical/etc way, THEIR “IT” dept has taken a cheap, small slow Win 7 Dell laptop and tried to put Win 10 on it! Slowest thing I EVER tried to use in my LIFE!!! Why would supposedly “smarter than me” types even try to put a 2GB proc, 2GB ram cheapo in service for the maint dept to look-up parts and tech data? Not to mention the absolute crawling speed of the dang thing not working for 1/2 hr+ at boot–trying to do updates or whatever. Then there’s the 5th level of user–which category “I” am considered to be part of “volunteers” user–which has many abilities STRIPPED from usage, in order to “PROTECT” the damn worthless laptop that was hot-rodded by them with a latest OS, (IT) using inferior hardware!!! I just bring my old Vaio with XP–10yrs old or more, to get any work done. You can bypass those limitations by running as the real Administrator account. The problem is that any process running under that account will also have full Administrator privileges and can install anything they want without asking you for UAC confirmation. Contrary to popular belief, those limitations on the account were not mainly designed to protect you from yourself. They were designed to protect your machine from hackers and malware. Those hoops we have to jump through are simply collateral damage of those protections. I have no idea how the two (tv ads and phone numbers versus your network administrator) can possibly related. All I can recommend is reading the article you just commented on, and perhaps providing a LOT more information when requesting assistance. I want to change my youtube name but I have A SCHOOL ACCOUNT. You should be able to open a new YouTube account. You may need to open a new non-school associated Gmail account to do that.